*Note: do not get Laniakea Beach (a.k.a. “Turtle Beach”) confused with Turtle Bay. There are rarely turtles at Turtle Bay. 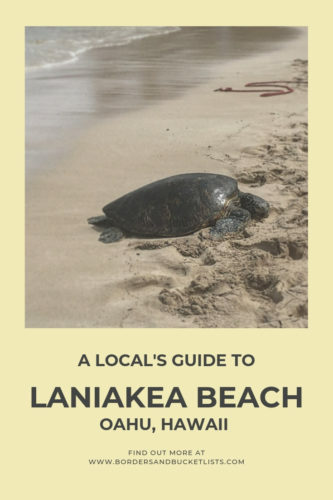 What Should I Know Before Going to Laniakea Beach? Do not touch the turtles! Stay five to ten feet away from them. Because they’re an endangered species, we want to make sure that they have their space at all times. All it’ll take is a slightly stronger current to shove you into them (which we don’t want, because it might hurt the turtles). Do not chase the turtles! You don’t like to be stressed out, so the turtles don’t like to be stressed out. Don’t chase them and stress them out please. Do not feed the turtles! By feeding the turtles foods that would not be part of their typical diet, you could actually hurt their digestive system. Plus, by feeding them, you are training them to get their food from humans, which could become an issue when humans stop feeding them. They will be out of practice when they have to go back to searching for food on their own in the Pacific Ocean. Do not ride the turtles! This might sound kind of absurd, but people have done so. Even our signs telling you to keep your distance tell you to not ride the turtles. How would you like it if you were sat on by a 170-pound human and had to swim to keep yourself afloat? Not a fun time at all. Bottom line: be nice to the turtles and respect their space bubbles. Laniakea Beach is located on the North Shore of Oahu. (It is further east than Haleiwa and further west than Waimea Bay.) There is no legal parking area for Laniakea Beach, but everyone just parks across the street, and it’s fine. When crossing the street to reach the beach, wait until there is a large gap in traffic. If there isn’t one, usually a local will stop for you and show you a bit of aloha spirit (a.k.a. local kindness). What is the Best Time to Go to Laniakea Beach? There isn’t a specific “turtle season” as there is a whale season, as turtles don’t migrate like whales do. However, we do know that these honu don’t like to be on shore when there are big waves. 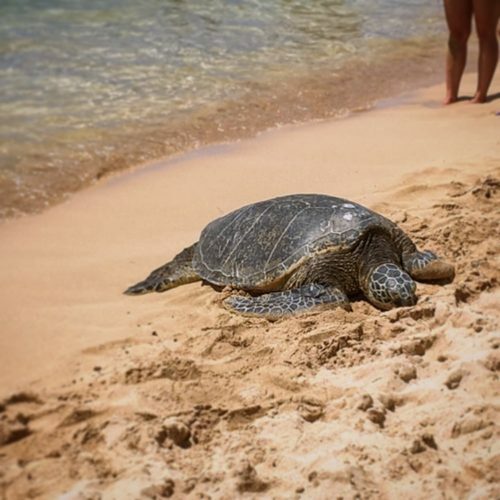 That means that during the winter months on Oahu’s North Shore, when the waves are huge, you’ll be less likely to see turtles at Laniakea Beach. 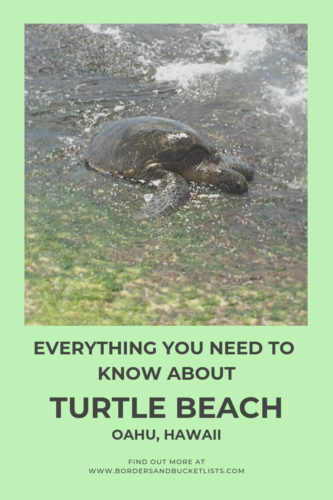 As for the best time of day, I’ve found that there tend to be one or two turtles on the shores of Laniakea Beach during all hours of the day in the summer. However, one of the volunteers at the beach mentioned that sunset is actually prime time to see turtles. These volunteers have reported there being up to eight turtles at once at Laniakea Beach during sunset! What Can I Do at Laniakea Beach? Obviously, with all this preparatory talk about turtles, everything to do at Laniakea Beach has to do with turtles. The easiest thing to do at this secret turtle beach is spot turtles. They will literally just be chilling on the rocks or sand. Maybe you’ll see them trying to swim up to chill on the rocks or sand. As a tip for spotting turtles in the water, it’s easiest to spot them when they get pulled up in a little wave, rather than in the flat portions of the water. At this Oahu turtle beach in particular, there are always volunteers, who are there both to protect the turtles and to answer your questions. You’ll notice that they’ll put a little rope in front of or around each turtle to indicate how much space you should give the turtle. Plus, if you have any questions, they’ll be happy to answer them! For example, I’ve heard people ask, “What kind of food do the turtles eat?” They actually eat the green algae that grows on the rocks. So be sure not to step on that when you’re wandering around on the beach! Not only is it slippery, but you’re killing the turtles’ food supply! Sticking to the sand is a good choice. Or just use your imagination to come up with more! 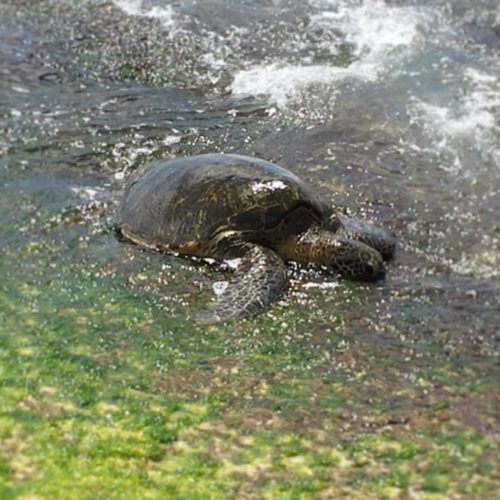 On the right side of Laniakea Beach, there is a small, rocky area where you can snorkel and try to see a few turtles. In my experience, this is much less successful than spotting turtles on the sand. But if you really want to see turtles swimming in the water, this isn’t a bad place to do that. Are There Any Hotels Near Laniakea Beach? In short, no. Laniakea Beach is a rather small beach, and while it does attract many turtles, it’s not really an ideal spot to lay out in the sun or swim for long periods of time. For those reasons (and probably due to the laws preserving the turtles as well), no hotels have decided to break ground near Laniakea Beach. Instead, use Airbnb! Airbnb rental rates range from $220 per night to $1,050 per night, depending on the property. Need help picking the perfect Airbnb for your needs? Here are a bunch of tips for you! 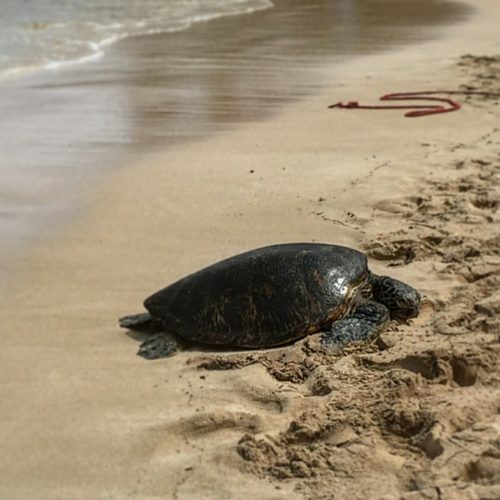 Looking for other beaches to spot turtles on Oahu? Here are a few more! Want to check out Laniakea Beach on your trip to Hawaii? Pin this post for later!